Portable Gemini Go Bundle at a special sale price AND with free shipping! This space-saving machine is faster, lighter and quieter than other die-cutting machines and has a sleek, low-profile design. It has been designed for intricate dies as well as for cutting heavyweight cardstock, vinyl, foil and multiple layers of fabric (depending on the dies used). Gemini Go also enables edge-to-edge cutting and also has the facility to pause, resume and reverse the plates within the machine. It's platform size is 3" x 6" and is compatible with most thin metal dies and embossing folders. *Gemini machines purchased here are 120v for United States power outlets and are not compatible with 240v. 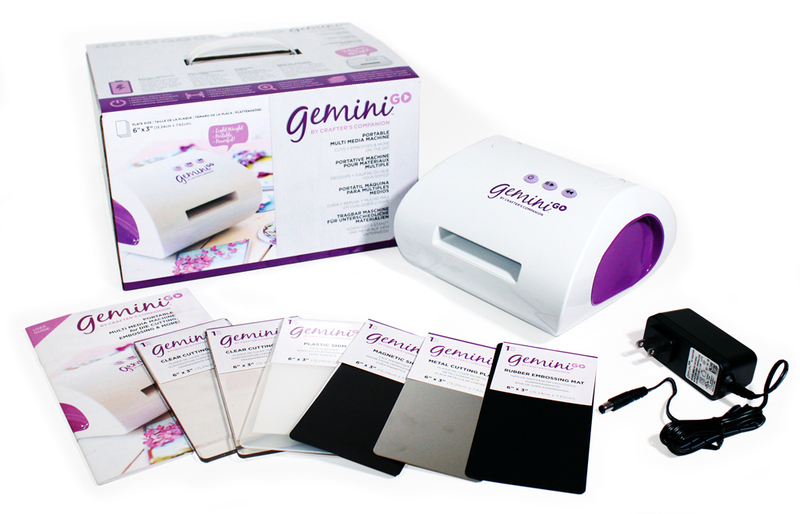 ***This bundle will ship direct from the manufacturer to you, so no other items can be included on your Gemini order.